Hello all! I have a 58 gallon 'Walstad' style tank that I'm currently running a fishless cycle on. Substrate is 1 inch of Miracle Grow Organic Choice with a 1 inch gravel topper, and a ton of plants. I know you supposedly don't need to cycle Walstads, but I'd rather be safe than sorry. Currently running a Fluval 405 with a Foam/Foam/BioMaxx/Carbon+Floss tray setup (Carbon just to get rid of the tannins, once they're gone the carbon is coming out). I'd like to stock with sunfish. My original plan was to stock five sunfish, one each of Dollar, Orangespotted, Bluespotted, Banded, and Bantam, plus six red belly dace and a madtom, but after further thought, reading, and calculation, I realized that would be WAY too many fish for a walstad. I've since reduced my stocking plan to three Dollar sunfish and a Madtom, but now I'm wondering if that's still too many fish for this tank. 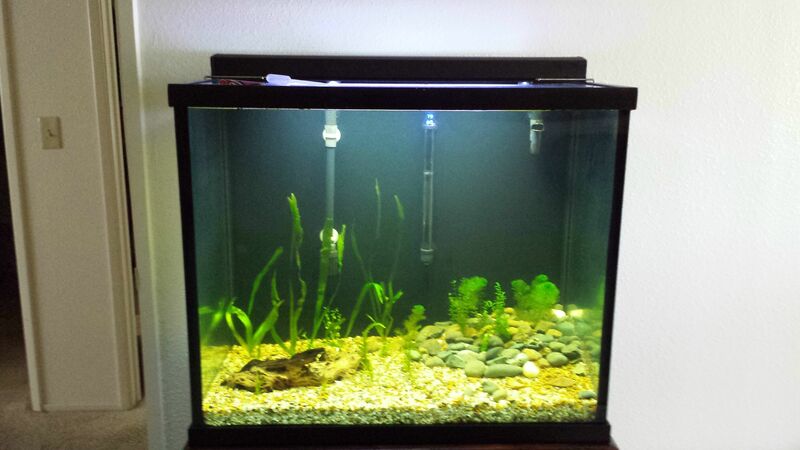 As you can see from the pics below, its a "tall" 58G tank. As I understand it, Dollars can get up to just over 4 inches in length. Is this too much fish for a walstad? My concern is having more fish than the plants can handle the waste for. They look sparse now, but I dont plan to stock until the plants have grown in and shot runners everywhere. If this IS too much fish, what alternatives do I have? If I can't do Dollars, I'd prefer to do a variety of sunfish, e.g. three sunfish, each from a different species. Which three could I jump on that would play nice together? Also, can a madtom work in this setup? Or will it try to tear out all my plants and dig out the soil layer? Thanks! What are the tank's dimensions? Looks like a fairly small foot print for multiple sunfish of any kind. Sunfish dig and will uproot most of your plants. Bluespotted and banded sunfish are small and shouldn't be as destructive, perhaps consider them instead. I think you don't have enough bottom space for dollars or even orangespots. Could get away with a few of the smaller species, though Bluespots would be my choice not aggressive as bandeds. Maybe someone with true experience with sunfish can correct me, but I've had my share of cichlids in my life and I think any dirted aquarium of any kind would not be especially smart. They like to dig, specifically, they like making shallow dishes in the substrate. That's gonna kick up all that dirt into the water column. On top of that, once your gravel cap has been moved around, and the dirt starts composting and producing CO2, its going to start spurting up on its own. Overall, you'll have a giant mess. Well thats a major drag. I set up this tank specifically for sunfish (the tank itself was a gift, otherwise I would have gone with a shallower tank). Any suggestions as to alternative native fish that might work? At this point I'm thinking one bluespot and one banded or bantam and a madtom and thats it. But at that point why did I bother in the first place? At this point I'm so discouraged I might just say screw it and do a standard tropical tank. Don't be discouraged. why are you thinking so few Bluespots? A tank that size could hold like six or eight Bluespots (I have five I am growing out in a 25 bow front and they have some swamp darters in there with them. Changing from Lepomis species to Enneacanthus is a huge difference. They are much calmer. The other option is a single sunfish. I have a custom made tank about your size that houses a single warmouth. And although he digs occasionally it does not ruin the substrate (functionally). It just looks bad on some days. Michael offers several good suggestions. Another potential setup would be the same approach that you would use if it was an extra-tall tropical tank -- select fish based on the layers of the tank (e.g., top, middle, bottom). 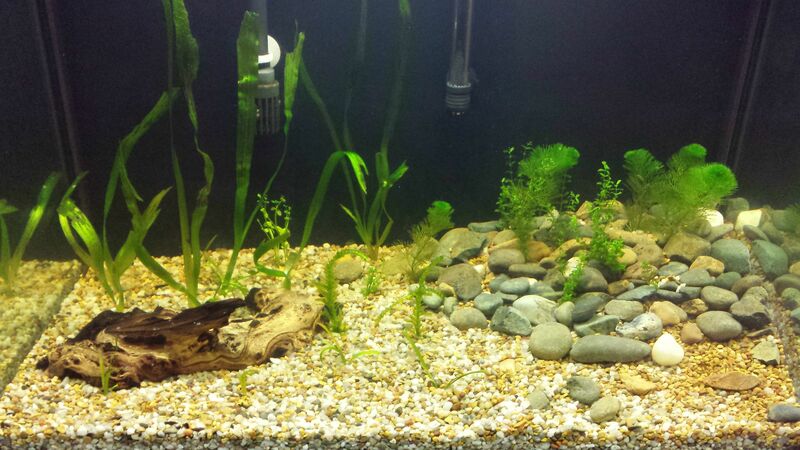 You could add some type of topminnow, there are many free swimming option for middle, and darter for bottom. This may not be the best or preferred combination of fish but I have used the basic approach with a 20g extra high in the past. The biggest challenge that I had was providing enough light (with the fixtures that I had at the time) for the plants given the depth of the tank. Any of the Enneacanthus sunfishes (banded, blackbanded, bluespotted) would be OK for that tank - they dont dig or pull up rooted plants. Also they would be safer tankmates for keeping with redbelly dace than Lepomis sunfishes would be. Provide a couple caves with bottoms for the madtom (such as pleco breeding tubes, or a clay pot saucer with a cut-out notch set inside a larger saucer) so he wont be tempted to dig. Speckled madtom is one of the smallest species. Bigger ones may eat the dace. Thank you all for the information and advice. I think I'm just going to go with a standard tropical stock for this tank. It seems this tank is just poorly optimized and set up for sunnies, so rather than struggling to make it work I'll just wait until I can afford a larger tank and do what I REALLY want to do, which is a Lepomis variety tank.